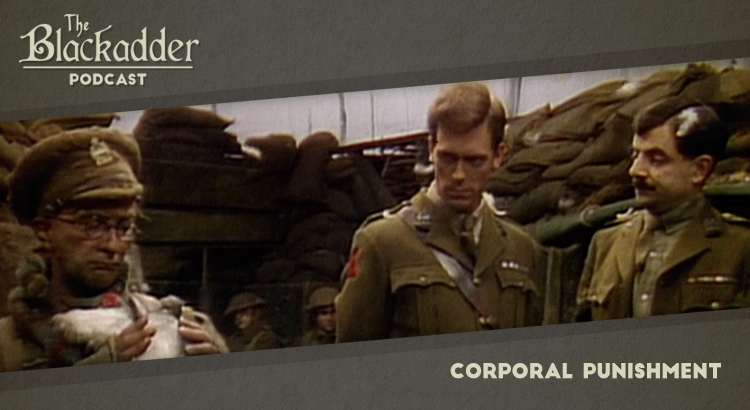 Corporal Punishment was the second episode of Blackadder Goes Forth and features an impulsive decision that Blackadder soon comes to regret. In this podcast Gerry and Iain consider justice, beloved pets and amateur lawyering. Alongside the series regulars this episode featured guest appearances from Jeremy Hardy as Blackadder’s jailer Corporal Perkins and Stephen Frost, Lee Cornes, Paul Mark Elliott and Jeremy Gittins as Corporal Jones and Privates Fraser, Robinson and Tipplewick respectively – Edmund’s jovial firing squad. Corporal Punishment was released in 1989. It is 30 minutes long and originally aired on the BBC. Blackadder Goes Forth is presently available on Netflix and a remastered set of the whole series is available on DVD around the world (Region 1) (Region 2).